Suzanne's Tribe: Books, QTLS, Dec's and Spiders! "He's Just Not That Into You" was Book 1 of my 52 books this year, and I have to say "I Just Wasn't That Into It." Maybe it's my age (21 ;) ) but I don't think so as I like well written YA books for a bit of light reading. I suppose what it boils down to is that I thought it was incredibly repetitive - like one chapter would have been enough LOL Oh well, pretty sure it won't be the only book that falls short of my incredible insight into writing this year LMAO. I have been told the films good, so maybe I'll rent that and see. 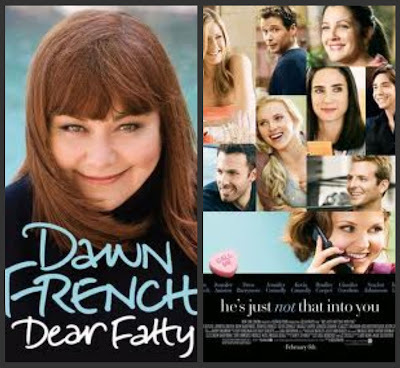 Next on the list, Dear Fatty by Dawn French. Tree and decorations came down yesterday :( Well, I say :( but it is :) to be able to give the house a good clean! Was ruthless putting them away, anything that hadn't come out of the boxes for a couple of years are now out of here! Including our artificial tree, bless, it had had a good life! Jeff took it down the dump and was about to throw it over the wall when a worker asked him to put it with the real trees. He pointed out it was artificial, so instead was asked to put it amoungst the scrap metal. Now I probably recycle for half of England, so the act of recycling is not one I have a problem with. But Jeff said 'are you sure?' cos he couldn't really believe that someone was going to sit there and pull the nylon bits off LOL Now I know what my council tax pays! At college yesterday morning. After spending 2 years (plus the specialism years) to gain my teaching qualification we get told that actually there's just one more bit! "So you can gain profession status". Okay, I have no problem with that - except my 2011 list seems to be growing, not shrinking! - but why didn't we just do it as soon as we had finished training. My brains had time to switch off...Dewey? Gibbs? 4 Levels of Consciousness? Off for a stroll around Amazon I think!